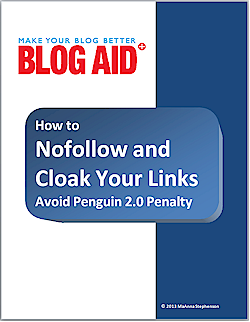 If you use any type of outbound link on your site you will need to nofollow and/or cloak those links before you get a visit from the new Google Penguin. And you may have more links than you realize. In a recent video, Matt Cutts shed light on what Google is trying to accomplish with the Penguin 2.0 update that was recently released. In it he mentions the halt of floating Page Rank often. That comes from outbound links, especially advertorials. Those could be affiliate links, PPC (Pay Per Click), or even an innocent “Powered by” link on one of your plugins. Find out what you need to know about the links on your site and how to correct any issues so that the Penguin doesn’t pop your site on its analytic head. This is a rather long post with full instructions. Click here or the free report image to download a copy. What Matt kept referencing in the video was “floating Page Rank.” Affiliate marketers also call it “leaking Page Rank.” These are outbound links from your site to other sites with products or services. By default, the links are dofollow, meaning that Google thinks you are endorsing the other site in some way. For the other site, that counts as a backlink, or inbound link. Google thinks sites with a lot of backlinks are popular, and ranks them higher in search. In essence, you are floating Page Rank to the other site and giving them a backlink. Backlinks are the backbone of SEO. You want as many of them as you can get. Because of that, too many site owners are using black-hat practices to get more backlinks, including practices that are explicitly against Google’s Terms of Service (TOS). Here’s an example. I use and recommend the BackupBuddy plugin. I encourage everyone every chance I get to use my affiliate link to purchase it. That’s part of my income on BlogAid. I’ve worked hard to build a reputation as a trusted source of the good stuff. And folks are happy to give back for all the high quality info I provide for free by using my affiliate links. Okay, good so far. Here’s my responsibility in all this. It’s a two-step process. I have to take steps to make the affiliate link to BackupBuddy nofollow. Basically, it’s a paid endorsement. And Google wants me to only send organic backlinks to their site, not paid ones. That’s part of their TOS. So, by marking it nofollow in the code, Google does not credit the site BackupBuddy is on with an endorsement, and doesn’t count it toward their ranking. Second, I have to tell my readers that they are clicking an affiliate link so that they know I get a commission when they purchase the product. I can do that a couple of ways. One is by putting the phrase (aff link) after the link. The other way is by putting a disclaimer on my site, which you can see on my Resources page. That’s where I have the bulk of my affiliate links for the products and services I use and recommend to my clients. I use both methods and even put a disclaimer in my post if it has a bunch of affiliate linked products. The Penguin 2.0 update is going after sites that float Page Rank on purpose to falsely boost the ranking of other sites. Here’s an example. Let’s say I used a pseudonym and created a bunch of sites on Blogger, Tumbler, or even WordPress. And I post blogs on those sites with rave reviews of BlogAid products and services with outbound links from the bogus site to BlogAid. Well, nothing wrong with that. Happens all the time. Lots of big time marketers do it. Google doesn’t like it, but can’t really do anything about it because the site doesn’t have scammy, low-quality content. And Google can’t identify the author as me. But, if I put affiliate links on that bogus site and linked them to BlogAid, uh-oh. Now I’m sending paid endorsements. That’s not only leaking Page Rank, it’s against Google’s TOS. And they’ll knock the rankings of that bogus site in the dirt. So, any inbound links from it to BlogAid are no longer worth much anymore. And, because of the Panda algorithm, BlogAid could get popped with a penalty for accepting inbound links from those bogus sites. (Panda, coupled with G+ Authorship, is Google’s way of trying to get rid of these secondary bogus sites too, which is one of the reasons why I don’t do them and why I don’t advocate them. If you already know of affiliate links, or any link where you get paid when folks either click or purchase the product, you need to make a list of them and get them fixed. Those are the easy ones to find. The links that are not so easy are any that endorse a product or service in any way, such as a “Powered by” link on a plugin. Or, it could be an attribution link on a photo you’re using. You might just want to go through every page on your site to be sure. Think of it this way. It’s spring and high time you give your site a good once over anyway. As for your posts, I’m betting you have a lot more of those. If you keep an editorial calendar or spreadsheet of them maybe that would be the quickest way to spot the ones you think may have a link that could get you in trouble. There are two methods you may need to use to fix your outbound links. The first is to make them nofollow. The second is to cloak them, which usually also involves a redirect. Both will be covered here. And, I’ve included the most common ways to do both. There are plugins to take care of links in bulk, but they may not help you with attribution links or those “Powered by” links. You may still need to fix those manually. I’ve also included some developer-level info so you will know all of your options, but I don’t cover them in-depth. I’ve given you links for more info in case you need it. Some sites simply make all of their outbound links nofollow by default. You can do that, but it’s not a good idea. Google expects to see organic outbound links on your site. I wouldn’t do it because of posts like Tips Tuesday, and I want to give a backlink to the sites producing the good stuff. Plus, I want those site owners to be notified when I do, which helps me build a relationship with them. So, think before you take what seems like the easy way out. Why Cloak and Redirect Links? Most affiliate marketers use a technique to cloak their links for several good reasons. 1. The first, is to hide the fact that you are an affiliate. That’s not a good idea anymore. You still can, and should cloak your links for ease of use by readers, but use the disclaimers mentioned above. See, isn’t the first one easier to remember? It’s easier for me to put on a webinar slide too, which is exactly why I made it. 3. The third, and most important reason to cloak a link is to keep it from being hijacked and used by a third party. It’s called “man in the middle” and someone redirects your link to one of their affiliate links which gives them your commissions. There are several ways to accomplish these two tasks. Some are easier than others, and some require you to get into the code of your site. I’ll show you all ways of doing it so that you understand what’s involved and why certain things need to be done. I know most folks are just going to want to skip to the easiest way possible to get their links squared away, so here it is. There’s a sweet plugin called Pretty Link that comes in a free (lite) and pro version. (You can find the Pretty Link Lite in the regular WordPress Plugin Directory. Just do a search while you’re logged into your site.) It allows you to cloak, redirect, and nofollow your links. You can also track clicks. Here are a few other easy ways to fix your links using TinyMCE Advanced or StudioPress Simple URLS. Those are then followed by the manual way of fixing links in the code, which you may need to do for attribution links and “powered by” links. If you’re using the TinyMCE Advanced text editor plugin, and I highly recommend you do, it has a nofollow option in the Advanced settings. Go here to see a video tutorial for configuring this plugin. First, go to Settings > TinyMCE Advanced. At the bottom you’ll find a section for Advanced Options. Click the checkbox for the Advanced Link option. Now when you make a link, go to the Advanced tab of the Insert/Edit Link pop up. 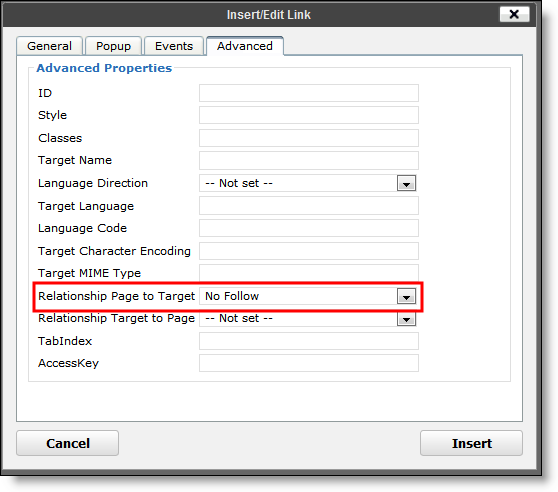 Near the bottom you’ll see a drop-down for Relationship Page to Target. Set it for No Follow. The only problem with this is that you have to turn on using the link maker in TinyMCE Advanced and I actually like the link maker that comes with WordPress better. The plugin I used to create the BlogAid.net/gaccounts redirect link is called Redirection. It’s easy and can also be used for permanent 301 redirects, which is handy if you want to send readers from an old site to a new one, or from an old post/page to a new one. You simply input the Source URL as the new, shortened link, and then the original, full link as the Target URL. An example is shown below. If you use a StudioPress theme, there is a nice plugin for it called Simple URLs that allows you to easily redirect your links via custom post types. However, it doesn’t have a nofollow option. But, Joost de Valk, the developer who made the super duper WordPress SEO plugin, has a simple fix for that in this post. The plugin puts all the links you want to redirect in a special directory. He tells you how to easily nofollow that whole directory, so you don’t have to do it a link at a time. You can add the rel=nofollow attribute to your link. You can do this for any link that you don’t want to leak Page Rank to, not just affiliate links. And, it may be the only way for you to add the proper nofollow code to some links on your site, such as attribution links. Here is a regular link. Here’s a link with the nofollow code added. Joost de Valk recently came out with a super post on creating a redirect script. The process works perfectly, but requires getting into coding places that I don’t advocate anyone but a coder do. The Penguin 2.0 algorithm has already been released and is making its way from site to site. Don’t put off getting your outbound affiliate or endorsement link situation under control. No matter how much work it is, or how disruptive to your schedule, it’s nothing compared to recouping the loss to your site from a Penguin penalty. Oh, thanks for that tip Andrew. It has been forever since I looked at the TOS of my affiliate links. Going to do that right now. I’ve tried pretty links and some other pluginss, however i was looking for way to automatically cloak all outgoing links on my blog, without having to generate or add links manually. I’m not sure if i can find a plugin that can do this, Any ideas? Andrew, I know there are plugins to block dofollow on all links, but don’t know of one that will auto cloak them too. If you find anything that actually works well, do let us know. I think my last comment didn’t make it through so I’ll try again. First, thank you SO much for this great, helpful report! I’ve been studying it and still trying to get my head around it all. I have the TinyMCE but I also have All in One SEO that has the nofollow option with the meta data so I can just select that when posting. I’ve begun going through my posts and pages, changing those. But since you don’t recommend just selecting all outside links to nofollow, how do we decide which to do or not? What about ministry links? Also, what about the social media links? We just got set up with Twitter. Do I need to manually change those links? Hi Dee! The links that Google will be looking hardest at are those that are promoting something for sale, like an affiliate link. And yes, you’ll want to nofollow all social media links. If you are using a plugin for sharing, there may likely be a setting in it to do just that. As for ministry links, I don’t know exactly what those are or where the go, but it is safe to give a backlink to other sites that your trust and want to help promote. Thanks MaAnna. So this would include Amazon, BN, Apple, Kobo–I’m affiliate with them. But the way I understand it, we aren’t allowed to mess with their codes in the banners or links. So how does one remain affiliate and do nofollow? Sorry; I’m still trying to understand it. Also, I got my Twitter button from them, not a plugin. Maybe this Pretty Link would solve my problems? Check the Terms of Service for each, Dee. But I believe you can mark the links nofollow, you just can’t cloak them. It’s the nofollow part that Google is most watching for.